Last year fall break, I went to meet Wesleyan alums who were doing business in New York through the KAI Entrepreneurship. 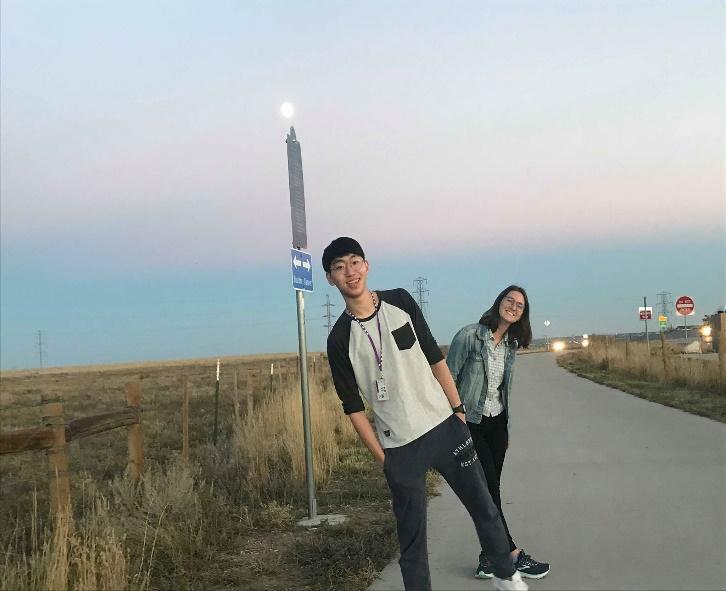 For this year’s fall break, I went to Colorado to help a State House Election Campaign and spent approximately two days doing Get Out The Vote (GOTV) campaign. Our field team usually went to working neighborhoods and canvassed from around 10 in the morning to 6 in the afternoon. Personally, I visited around 200 households and interacted with 40 people, trying to convince them to vote for Dr. Yadira Caraveo and recorded their responses on an app called the MiniVAN. Wesleyan CSS Alumni who is in charge of the campaign contacted me to feel free to come help canvass during fall break and offered to provide housing. President Roth sent us an email about a newly established Political Fund that can support students up to $500 if they are interested in campaigning during fall break. I couldn’t not go because not only did I had money provided for transportation, but also because I had a place to work and a place to sleep in. I didn’t want to miss the opportunity when everything was nicely plated on a dish. Friday. I left right after class ended at 4 to JFK. But I missed the flight by 10~20 minutes and spend the night at the airport. After changing the ticket, I took the 7 A.M. flight on a Saturday morning and arrived at 10 A.M. at Colorado Denver. Although the start was rough, I learned so much from the short two days I’ve spent doing GOTV and was inspired by my co-workers. On the first day, I went around with a 50-year old lady named Debbie and learned how to talk to people on why they should vote for Dr. Yadira. Debbie, as a previous director at Lexus who used to sell cars, was really good at convincing. I could literally see people’s ballots changing in just 5 minutes. But the most jaw dropping aspect was her stamina. Walking around 7~8 hours with an energy full of excitement, Debbie inspired me so much. The entire campaign was directed by two Wesleyan alumni who just graduated this year. I asked one why he went to Colorado instead of places like Boston, NYC, DC, or LA where most alumni go after graduating. He told me that he came to Colorado because he valued the quality of life that comes with the picturesque scenery of the mountains over prestige of institutions. He also stated that since Colorado is relatively small, he would be able to make the change he wants to make more directly. Listening to him, I was also able to think about what kind of life I wanted to life after graduating. Canvassing, I was able to recognize not only the people who works at the campaign office but also the numerous people who votes for the candidate. Working for a democrat candidate, I met a lot of Spanish workers. Talking with them, I was once again able to realize how massive the responsibility is that is put upon the candidate. If politicians think for a second about the people who votes for them, they can’t become corrupt. Last year summer when I was working for the People’s Party for Korea’s 19th Presidential Election Campaign, I felt that politics was like gambling. No matter how much money and effort are spent on campaigning, the whole operation can dissolve into nothing. But meeting people at Wesleyan who viewed campaigning as marketing and hearing people talk how going into politics is the most direct way to impact the world we live in, I left a door slightly open for my interest on politics to slip though. But while the abovementioned views on politics are true, canvassing in Colorado, I was able to notice the distinction between policy making and electing a candidate. As the purpose of campaigning is to get a politician elected, if one is more interested in policy research, think tanks or the academia may be a better option. A lot of things happened in just two days. Walking around 7~8 hours, my heels got ripped. A small dog suddenly came out the door I was knocking and even bit my calf. But while I was not confident to tell people to vote for Dr. Yadira the first day, walking hours after hours became the bigger burden the second day. In that sense, I feel like I may have learned how to canvass. This campaign was an opportunity for me to think things in different ways. I sincerely thank both Wesleyan and the CSS alums who made this experience possible. I also wouldn’t be able to forget the blue sky of Colorado that had a pastel toned backdrop of the mountains.